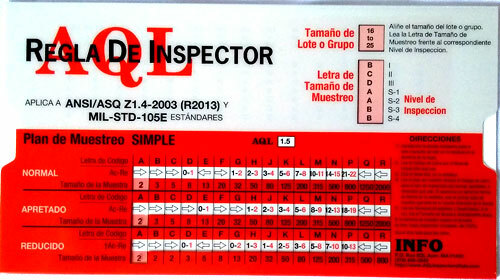 For over 3 decades Quality Inspector's have to been using the AQL Inspector's Rule to ease their job. This easy to use slide Rule simplifies and streamlines the process of looking up Accept and Reject numbers for inspection using the MIL-STD-105E, ANSI/ASQ Z1.4-2003 (R2018) or ISO 2859-1 (1999) standard. Single and Double sampling plans. AQL levels from .065 to 15. Normal, Tightened and Reduced Inspection levels. January 2019: ANSI/ASQ Z1.4-2003 (R2018) standard revision has been released. Click here for our notes on this standard revision. 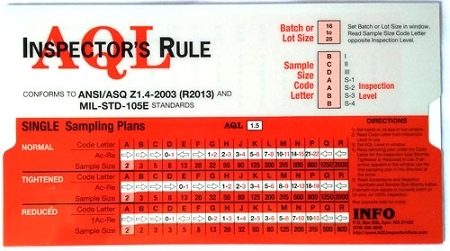 The AQL Inspection Manual is included with every AQL Inspector's Rule. 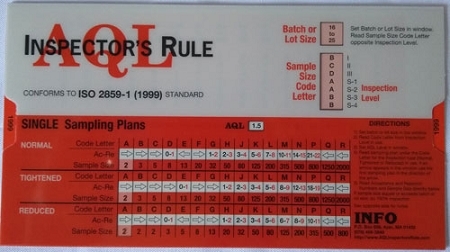 This 16 page book instruction and examples on using the AQL Inspector's Rule.